Pinot and Prose: Fill 'Er Up! I don't know. What do you guys think? Is this all kinds of awesome...or a bit strange? There's a kiosk in Chelsea Market called the Filling Station. 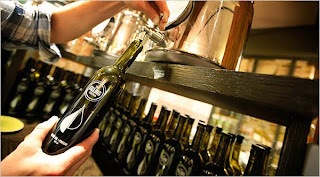 And it's exactly what it sounds like: rows of olive oils and vinegars where you buy a bottle...and then you can return to refill it at a 10% discount. They also have salts and sugars treated similarly - they are sold in refillable containers. Adam and I actually stopped by there (quickly) one night while we were on our way to the Biergarten at the Standard Hotel. It actually looked pretty cool. The thing I really liked about it was that next to each pump (is there another name I should call them by?) was a stack of tiny paper tasting cups and we were free to taste at will. Which reminded me of my beloved O & Co. where the purveyor wants to educate the customer as part of their business model. Laura: Faaabulous. And get me some olive oil while you're there! Eat, drink, and kudos to yuppy green living.